Restful sleep is so important to people’s daily lives, it has a huge impact on how we live. This product will help all side and fetal position sleepers get a more restful, efficient night’s sleep. Today, Clone Pillow launches on Kickstarter to provide a new level of comfort to those who suffer from sleeping disorders, physical pain or other limitations. Clone Pillow uses cooling gel technology and premium-grade shredded memory foam to create a contoured body pillow that gives users the best night of sleep possible. Clone Pillow’s premium-quality shredded memory foam makes it easy to mold and shape the pillow to support sleepers where they need it most. With a patent-pending contoured design, Clone Pillow will comfortably mold to any body type, and the innovative material helps reach a new level of relaxation at night to achieve the deepest sleep. This helps people with various types of physical pain or people recovering from injury or surgery. The conforming material is also perfect for women who are pregnant. Clone Pillow is designed with a custom size and shape to keep the body aligned and evenly distribute weight. The pillow takes up minimal amount of bed space, and the custom shape is designed to naturally relieve pressure points of the hips, elbows, wrists and hands, and improve spine, hip and shoulder alignment. The pillow shape brings ultimate comfort, which enhances muscle relaxation and promotes blood circulation. This sleeping position can reduce snoring and prevent endless tossing and turning. The Clone Pillow dimensions are 14 x 49 inches. The cooling gel technology panel spans the length of the pillow on one side, providing optimal body temperature regulation by transferring heat away as a person sleeps throughout the night. The gel cover prevents waking up with night sweats and hot flashes. The cover is made with 60 percent polyester and 40 percent bamboo rayon fabric, and the gel panel dimensions are 11 x 42 inches. Clone Pillow also comes with an additional white 100 percent cotton pillowcase. Clone Pillow is currently available on Kickstarter for $79. For more information or to pre-order, visit pr.go2.fund/clonepillow. Creator Jennifer Musolf wanted to create a better body pillow to go between her legs as her regular pillow kept falling to the floor or taking up a lot of bed space. 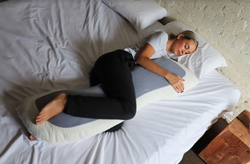 She also realized that she could not find a unisex version, leading her to create a contoured body pillow to ensure the most restful sleep possible for many types of sleepers. For more information about Clone Pillow, visit https://producthype.co/clonepillow/.